This ad was Tweeted by @sarahleavitt and others. 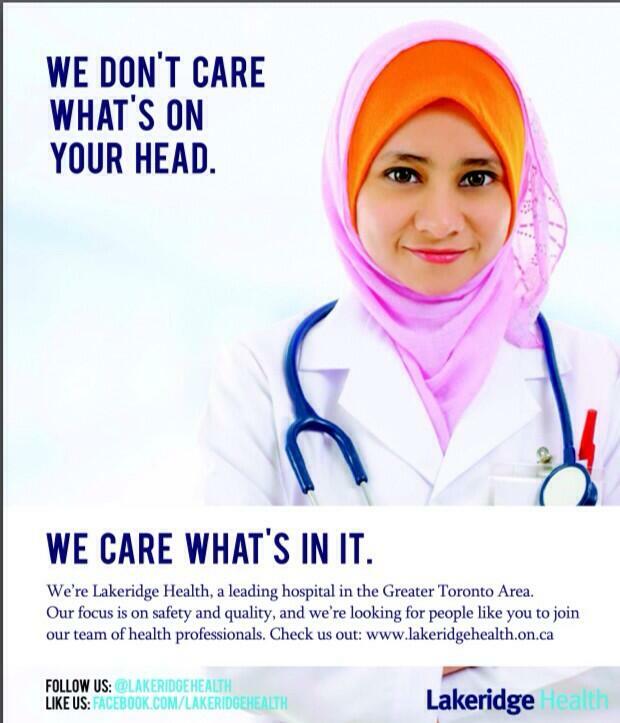 I can't seem to find it on any of Lakeridge Health's web or social channels, so I don't know whether it predates yesterday's news from Quebec, or if it's a coincidence, or even if it is a real client ad. 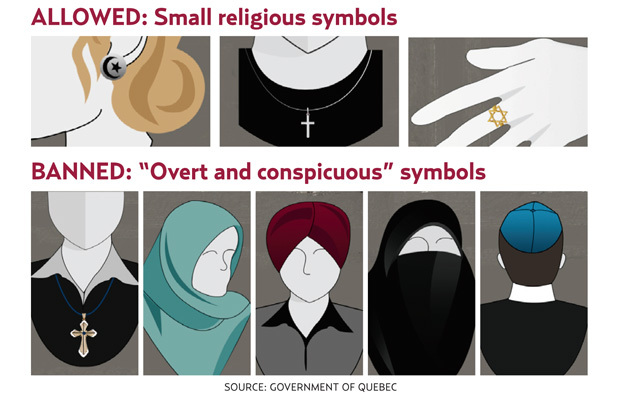 What the ad is, however, is a wake-up call to Quebec's provincial government, who yesterday introduced a "Charter of Values" that would prohibit the wearing of "overt religious symbols" in public workplaces, or even when doing business with the public sector. Bizarrely, while hijabs, turbans, kipas and comically-large crosses are explicitly banned by the decree of enforced secularism, existing Christian symbols in prominent places like Quebec's legislature and the provincial flag get to stay because of "historical patrimony". In Quebec, as in all of Canada, public education, including universities and colleges, and hospitals are provincial responsibilities. The Charter apparently will include a five-year exemption clause for municipalities, hospitals and postsecondary institutions that wish to allow their employees to continue wearing religious symbols on the job. But the xenophobic nature of the Charter is clear to targeted groups. Which brings us back to the ad, above. Having done professional recruitment for hospitals myself, I know that there is an HR crisis. The competition for nurses, doctors, technologists and others is fierce, with employers often aggressively recruiting in other cities, provinces, and even countries. In an increasingly multicultural Canada, many of the healthcare professionals we come in contact with are new Canadians whose cultures include these types of religious attire — for example, Islam is Canada's fastest-growing religion. Quebec already has long had problems keeping its healthcare workforce, because of lower compensation and language law issues. 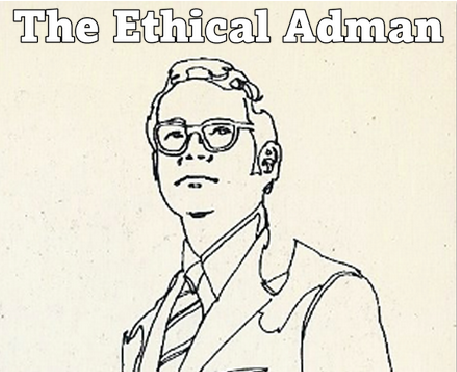 Will the new "values" take the brain drain to the next level? Dr. Sanjeet Singh Saluja, who wears a turban as part of his faith, said Wednesday that the PQ’s controversial “Charter of Quebec Values” would drive people from the Sikh, Jewish and Muslim communities away. “The sad thing is I don’t know if I’d be able to stay here in Quebec,” said Saluja, an emergency-room doctor with the McGill University Health Centre. While it might seem opportunistic for "Rest Of Canada" hospitals to use the Charter's presumed racism as an edge in poaching candidates, can we blame them? While analysts say that the Charter is unlikely to pass, the message to people who publicly practice non-Christian religions is clear: Give it up, or move on. Very good article. It's an interesting addition on my inquiry about billing and healthcare. Thank you very much.